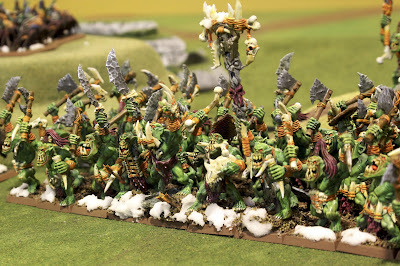 Long time followers of this blog know that I have been working on an Orcs and Goblin Army for PappaJJ for greater than one year at this point. I am proudly announcing today, that it is finished! It features over 2K points worth of core units, two 40-orc strong units, and plenty of characters. I'll be posting the army over the next several posts and going into detail about each unit and the heroes. Don't worry, I'll be back to painting 40K armies soon enough. I have lots of Inquisitor models to share. PappaJJ has been very gracious in making sure I had plenty of time to work on other projects while working on his army. However, I'll make it said that since Adepticon finished this year, I've work hard-core on finishing this army. Now its time for some hard earned time off, mainly to clean up my hobby and painting area! One of the cool things about this army is that PappaJJ wanted an unusual paint scheme- no red, no yellow, no black. In fact he wanted winter colors and something that worked well with his Dark Elves. So purple and orange finally emerged as the key colors to balance out the green skin of the orcs. It was a fun army to pain, but using this colors proved to be a fun challenge. It was great fun working with snow effects to try to create some freshly fallen snow. Awesome work, dude... awesome. Wow. I really appreciate what you've done with this army and am super grateful that you were willing to do so much work for me. Thank you, thank you. Hopefully it wasn't too soul-crushing once you got past assembly and ranking of the Boyz (... maybe?). Nicely timed too as you can now get back to work on your 40k stuff just before the new edition arrives. Sweet, I can't wait to see what type of Inquisitor plans you have beyond what you put together for Adepticon. The purple and orange tones are ACE -and a genuinely original break from the worn-out arrangements. Well played, sir. Congrats on finishing. It's a nice looking force to see en masse. 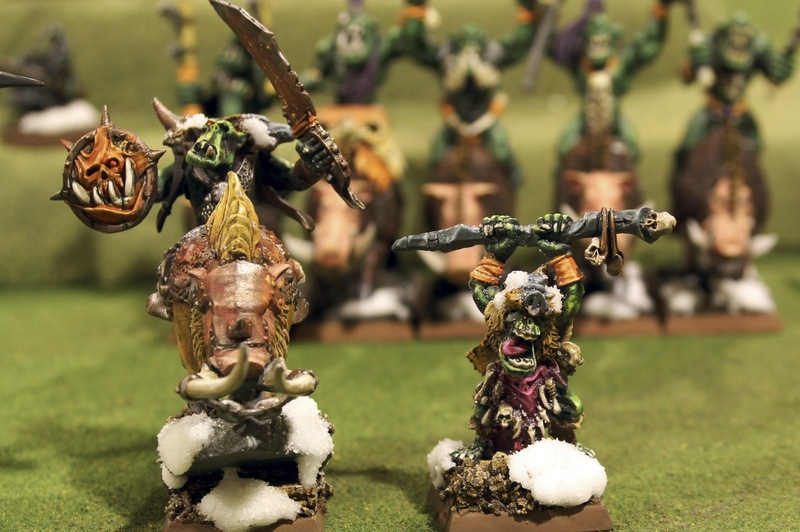 I really like that you've included some basing material (namely snow) on top of the models as well. Many congratulations, mate - this is absolutely smashing! Thanks everyone for the kind words. It means a lot to me that people take time to offer comments (especially the nice ones!). @Warhammer40K-1 : I'll do a special post soon on using the snow effects. I think I tried each and every method along the way! Yes, adding the snow to the figure (not just on the base) added a great touch to some of the front rank models. @Brian- thanks! If I was left to my boring ways, I'd pick something tried and true, so thank Jason for making me pick something different. Enter Reaper Master Triad Paints. These things were a god send to making those colors work. @Jason- anytime man (well not anytime soon mind you!). That soul hasn't been all that crushed (just a touch) and my amnesia makes me forget most of the worst parts of the process, so that is a plus. You know I jest, it was fun! You better send some foam out this way or I am going to start playing this army!